Are you accustomed with the smiley face in your Yahoo Messenger or MSN? Have you ever wondered if you can do the same thing with your iPhone in sending SMS and email? Well, there are a lot of free emoticons applications in App Store that you can choose from. In my iPhone, I specifically installed Emoji Free. Once you installed the free application, you need to restart your iPhone. After that, go to Settings - General - International - Keyboards. At Keyboards, find Japanese then turn Emoji ON. To test if Emoji is working, Compose a message then tap the Globe icon before the space bar. 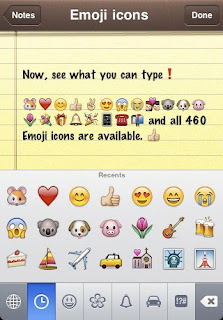 You will see five additional icons wherein you can choose over 450 emoticons. Cool right? HEY thankz for those methods to add emo, useful for me! we as blogger from asia should help each others in digg, i added u as my friend and will digg all ur post! Hope you will do the same! lets rock digg together!! !